participating for years, their kids are born here, you know, it’s first secure the border, pathway to citizenship, done, whatever little penalties you want to put in there, if you want, and it’s done. The reality is that the rot cuts much deeper. The GOP doesn’t have a problem with Latino voters per se. Rather, it has a problem with a broad spectrum of voters who simply don’t feel that it’s speaking to their economic concerns. The GOP has an economic agenda tilted strongly to the benefit of elites, and it has preserved support for that agenda—even though it disserves the majority of GOP voters—with implicit racial politics. 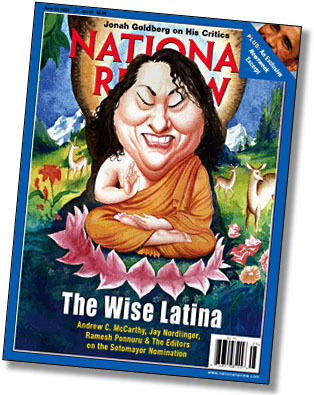 Consider the GOP’s deeply racialized campaign against Supreme Court Justice Sonia Sotomayor. What was so surprising about this—and I know I’m not the only fair-skinned English-dominant person with a Spanish surname who was genuinely shocked—was that conservatives could have easily opposed her purely on policy grounds. Sotomayor is a fairly conventional Democrat on constitutional issues, and that would have been ample reason for conservatives to criticize her. Indeed, Justice Elena Kagan was attacked on precisely those grounds. But rather than tempering opposition with at least some recognition that Sotomayor’s life story might be a great example for immigrant parents trying to raise children in difficult circumstances, the country was treated to a mass racial panic in which Anglo America was about to be stomped by the boot of Sotomayor’s ethnic prejudice. The graduate of Princeton and Yale Law, former prosecutor, and longtime federal judge was somehow not just too liberal for conservatives’ taste but a “lightweight” who’d been coasting her whole life on the enormous privilege of growing up poor in the South Bronx. I know they don’t want to hear this, and I know that a lot of Republicans are deeply invested in a belief that liberals, not conservatives, are the real racial scaremongers. And I also know that it’s almost impossible to talk about this because even the slightest suggestion of racial hostility is instantly toxic. But as Bernie Goldberg admitted earlier this year, “There is a strain of bigotry — and that’s the word I want to use — running through conservative America….That has to leave the conservative movement….I am sick of it.” He’s right. Lightening up on immigration won’t be enough. Like it or not, conservatives are going to need a much more thorough housecleaning if they want to survive in an increasingly diverse future. No more gratuitous ethnic mockery. No more pretense that reverse racism is the real racism. No more suggestions that minorities just want a handout. No more screeching about the incipient threat of Sharia law. No more saturation coverage of the pathetic New Black Panthers. No more complaining that blacks get to use the N word but whites don’t. No more summers of hate on Fox News. No more tolerance for Dinesh D’Souza and his “roots of Obama’s rage” schtick; or for Glenn Beck saying Obama has a “deep-seated hatred of white people”; or for Rush Limbaugh claiming that “Obama’s entire economic program is reparations.” No more jeering at the mere concept of “diversity.” And no more too-clever-by-half attempts to say all this stuff without really saying it, and then pretending to be shocked when you’re called on it. Pretending might make you feel virtuous, but it doesn’t fool anyone and it won’t win you any new supporters. That’s just a start. One way or another, the Republican Party simply has to stamp this out. And not just because they need to do it to survive, but because it’s the right thing to do. That still counts, doesn’t it?